A few years ago customer called us to inspect their wood burning stove. We of course did this and as the cap needed cleaning we went to the top to remove the creosote. While on the roof we also checked out the $2300 worth of "repairs" that were performed by a company to the oil flue and chimney crown. Supposedly it was fully relined in stainless steel and the crown was rebuilt but the truth was quite the opposite. Upon inspection of the top, the liner was found to not reach the top of terra cotta tile and was not secured with a top plate. The "re-crown" was actually some form of coating that was applied very poorly and not even completely. All of these are huge red flags. This however pales in comparison to what happened at the base of the chimney at the oil furnace. The previous company broke the tile on purpose at the base of the chimney and allowed for a massive hole to exist into the ash drop area of the fireplace (as a fireplace was also connected to this chimney). 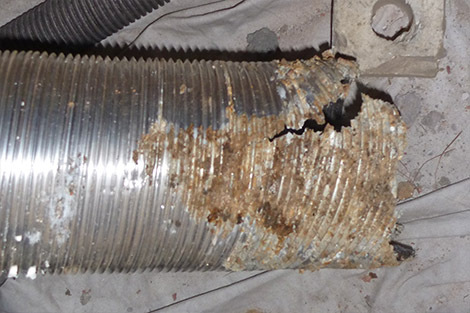 Not only that, but they never actually hooked up a stainless steel liner at the bottom--it appears that only a small section was put in at the top to make it look like a liner was installed. So what does this mean? They damaged the customer's flue causing oil furnace exhaust gases (lethal carbon monoxide) to blast into the ash drop area and into the customer's home and NOT up the chimney! Thankfully the oil furnace was really only used for hot water in the winter as they have a wood burning fireplace. The consequences could have been grave, never mind the loss of $2300. Upon seeing all of this we asked to see the receipt. The company barely filled in any information on the paperwork and upon calling the phone number the line was disconnected. This is an unfortunate situation that happens very often to uninformed customers caused by out of town con artists. Remember: Caveat Emptor! Let the buyer beware! 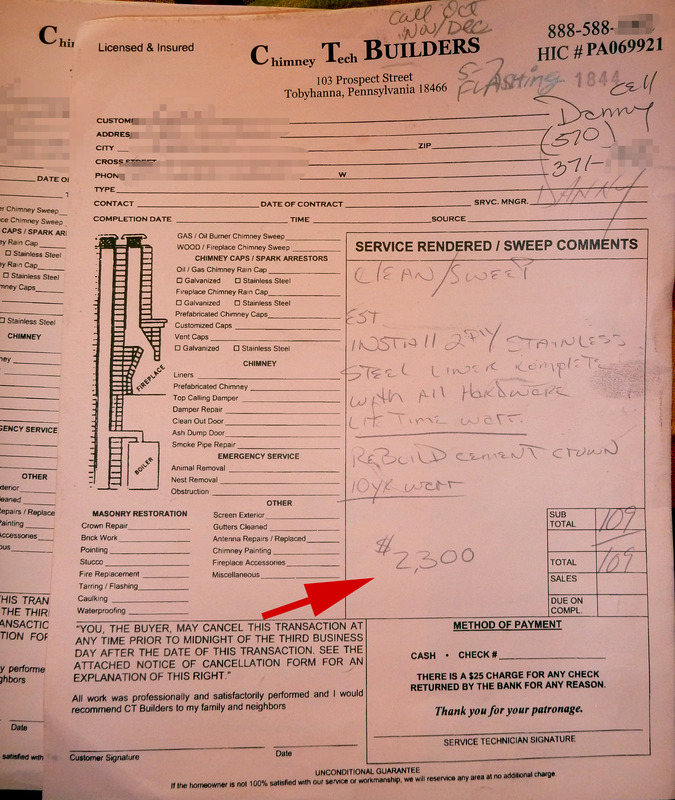 Don't get lured in by low price inspections only to be tricked into overpriced and unsafe repairs. Please view the images below to see what was done, and what should have been done. If you have been contacted by a questionable company and are looking for an honest opinion from a local, knowledgeable sweeping company please view our contact page. Don't let your liner end up looking like the above picture. This is what can happen when installed incorrectly by a disreputable company. As a locally owned and operated business, Clean Sweep has been the #1 source for chimney related service and repairs in the Lehigh Valley since 1978. Companies who are from out of town often say they are local but arrive at your house in a white unmarked van usually with New York or New Jersey plates. All too often we are called in as second opinions because a customer of ours is scammed or nearly scammed by these types of con artists. We pride ourself in giving you our honest no-nonsense opinion and product recommendations based on what you actually need. 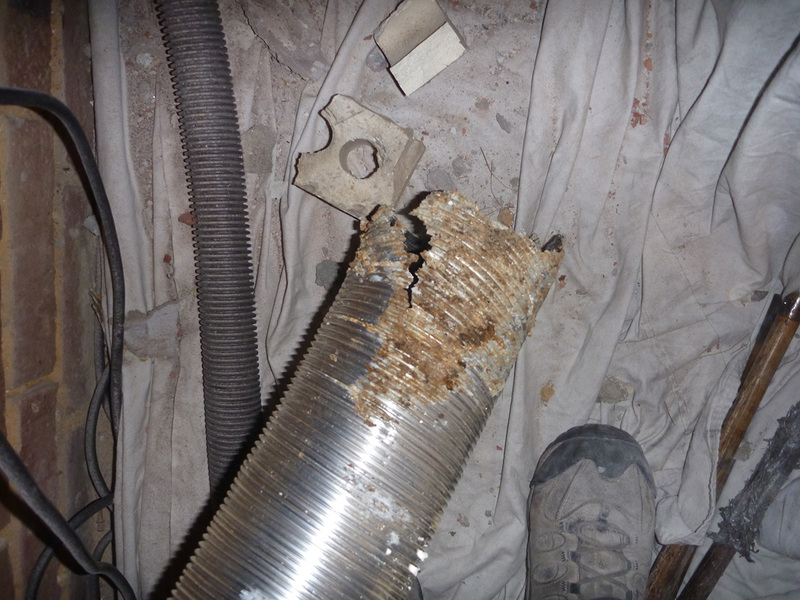 We also provide photographic proof showing you the condition of your chimney, flue, or wood burning application if it does indeed need repair. For a more in-depth explanation please reference this article found on Angie's List about chimney specific scams. Knowledge is power! Remember if it sounds too good to be true it most likely is. 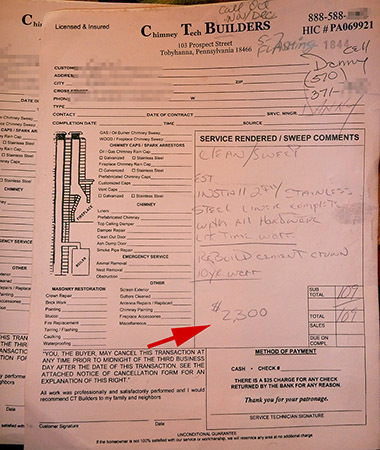 If you're told a chimney sweep is "in the area and offering $20-50 for a cleaning" it most likely isn't legitimate. In this picture you will notice that our installed top plate on the right is securing the liner to the terracotta tile correctly. The incorrect installation is dangling in place and the cap was merely caulked on and barely secured with a masonry cap--not a circular liner cap. This picture shows the incredibly poor quality of the repair to the crown. Instead of removing the crown which was falling apart, the previous sweep put a coating on the top and did not even cover the entire top of the crown. The cap used for the oil flue is also the incorrect type. The correct way to re-crown a chimney is pictured above. Notice the slope which will allow for proper moisture run-off. Our re-crowns are also reinforced with an additive called PWR which permanently waterproofs the mortar so we can guarantee our work. The cap pictured is what a completed top portion of a liner from us looks like. On the left, our liner base is pictured. The circular portion is where the furnace pipes would connect and the gases would make their way up and out of the house via the new stainless steel liner. The picture on the right shows no liner--not even a terra cotta lining! The con men had actually broken off a piece and by doing so allowed the gases to go into the chimney foundation. The oil soot can be seen on the cinder blocks. This is the bill for the fake company which did this supposed repair job. All contact information is disconnected and the address is fake. To view the image larger click on the picture. Don't get taken for thousands and risk your family's safety. Deal with a company you can trust who has been a local institution for over 35 years: Clean Sweep!